IPCC have a five year Strategic Business Plan spanning the period from 2016-2020. This document was developed by the Committee of Management of the IPCC as part of their governance of the organisation. 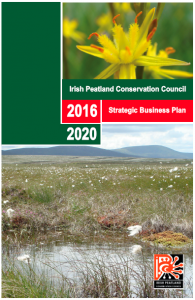 IPCC’s mission is to ensure the conservation of a representative sample of the peatlands of Ireland for future generations to enjoy. Our Strategic Business Plan will help us to achieve this. The Strategic Business Plan focuses on 7 key activities of the IPCC which are needed to achieve our goal and lists the targets we hope to achieve by 2020. A brief description of each one is given below. The Irish Peatland Conservation Council can be contacted at the Bog of Allen Nature Centre, Lullymore, Rathangan, Co. Kildare, R51 V293, Ireland.